I happen to know a thing or two about prepping for babies. After all, I did have to prep for three at a time. One thing in specific stands out to me when looking in retrospect at the weeks after my children’s births. The things that my husband and I ran out of were surprising. It seemed as if we always had formula and baby clothes, but I couldn’t find a roll of paper towels within a five mile radius. 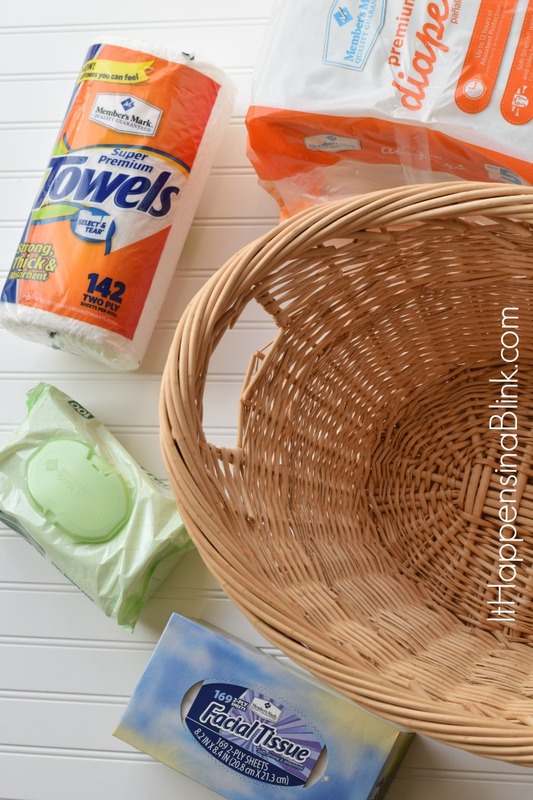 My experience has allowed me to know what to pack when creating a gift basket for a new mom. I’ll let the grandparents buy the cute baby stuff. When the going gets tough at 2 am, nothing beats a good stash of supplies for baby and home! My husband I have have been members of Sam’s Club for a decade now. 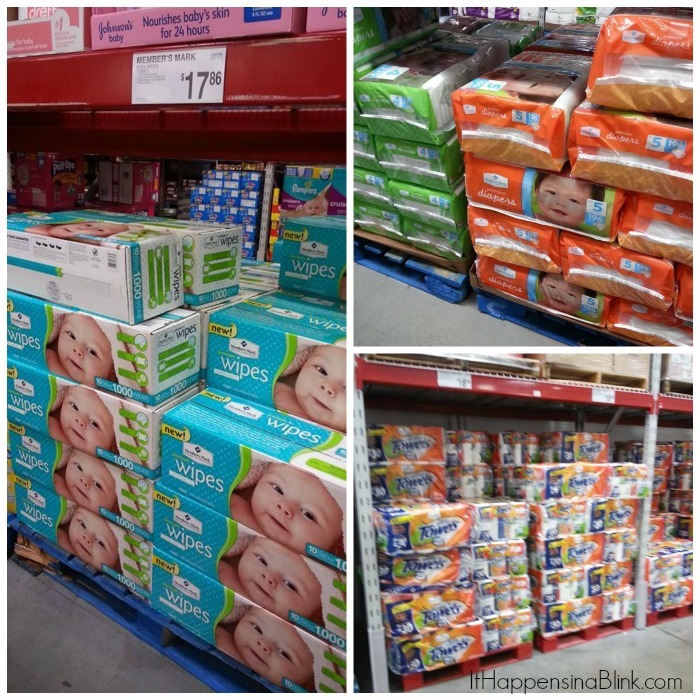 It’s where we stock up on everything that we need to purchase in bulk, including baby items. Buying the Sam’s Club Member’s Mark or Simply Right brand helps us save even more money. As experienced moms know, it’s not only baby items that you need when becoming a new mom. 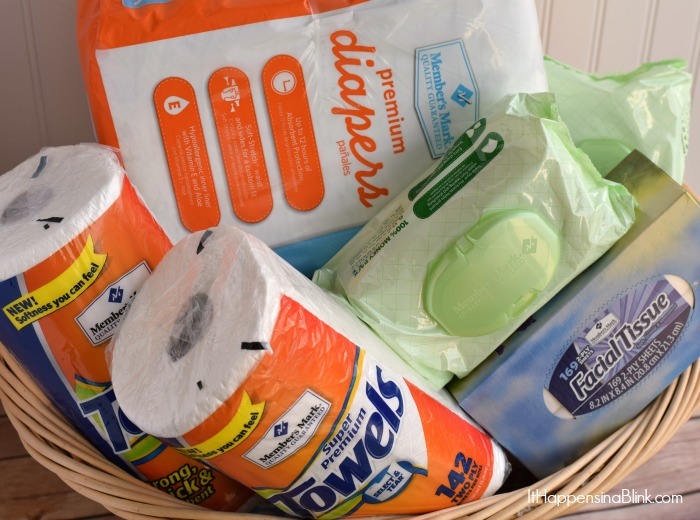 If you’re looking to create a new baby essentials gift basket for a baby shower, get the parents started off on the right foot with a huge basket of necessary items. I’ll also give you a hint to buying in bulk. Many (if not most of the items) come individually wrapped or packaged. This means that you can disassemble the main package and make multiple gift baskets. Or you can keep have the stash for your own home and include the others in the basket. Even if you do not intend to include everything in the basket, buying in bulk is a great way to save money all the way around. 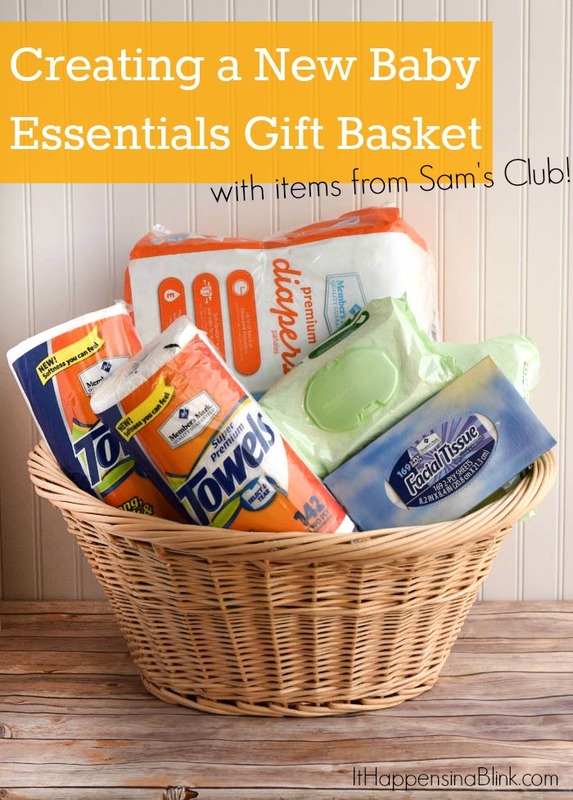 Here are a few things to include in a new baby essentials gift basket, all of which can be purchased from Sam’s Club! Diapers – Any size will do. The baby will eventually use them all. Wipes – Wipes are multi-purpose. I use them for cleaning up messes, too! Paper towels – After four kids who had acid reflux as infants, I can assuredly say that babies are messy. Batteries – Yes! Baby gadgets take lots and lots of batteries! Bottled water – This is especially great for the breastfeeding mom to keep by her bed or pumping station. Other items to consider, based on the family that you are gifting to: Paper plates/cups so the new parents do not have to do dishes, trash bags for all the new baby garbage, and perhaps formula if you know what the new parents are using. Purchase a large basket to place all the items in. I had a few gifts that were given to me in a laundry basket, and I thought that was a wonderful idea! I was able to use the laundry basket in the kids’ bedrooms. One benefit of being a Sam’s Club member is receiving the complimentary Healthy Living Made Simple Magazine. I always look forward to receiving the magazine and browsing the collection of informative articles. The March/April issue had an excellent article covering diaper rash basics! Member’s Mark items from Sam’s Club can be found in various departments in the store, depending on what you are looking for. Here are a few things that I found around the store. Are you a Sam’s Club member? Have you ever checked out the Healthy Living Made Simple magazine? This gift basket is awesome….perfect for a baby shower gift! What a great idea! Next baby shower I attend, I will get useful items instead of my usual hand painted coin bank… cause they really need diapers! I love this! All such good ideas! These are all great ideas. I love buying cute items for friends — but I also really love buying the practical baby stuff in bulk… because honestly, that’s what everyone needs! Who doesn’t love to be stocked up so you don’t have to run to the store at 2am. Great ideas! What a great idea! A little less for the new mom to think about! this is so great.. after the first baby this is really all you need! 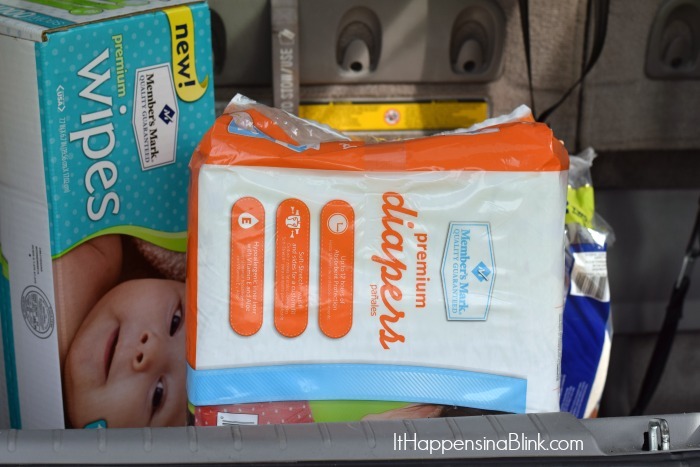 Diapers and wipes!! I agree with Emily. I wish I could have returned half of the cutesie things people got us for our baby shower and just replaced it with diapers and wipes. They are sooooo expensive. This is awesome! I’m going to be needing this soon. Anything I can have on hand ready to go will be wonderful! What a great idea! I always have such a hard idea knowing what to get a new Mom. I would’ve loved to get this when I was a new mom, great ideas!